For many years after I became a Christian, I operated under a false sense of who I really was. I had no idea the change that occurred in me the moment I accepted Christ. I did not see myself as God saw me. I had a grid system or a sieve of inferiority, insecurity, and inadequacy over my mind. When I processed information about my world and about myself, it had to first filter through that negative grid system. If someone canceled a lunch date, I interpreted that as “she doesn’t like me.” If I didn’t get invited to an event, I interpreted that as “I’m not worthy.” If my husband didn’t give me enough attention, I interpreted that as “he doesn’t really care about me.” If someone asked me to take on a project, I immediately thought, “I’m not capable.” My interpretation of events and other’s actions were distorted by the devil’s lies. It was not until my thirties that I began to realize that how God saw me and how I saw myself were very different. Like a hungry child, I began to research and write down verses about who I really was in Christ–my true identity as a child of God. I learned that I was a child of God (John 1:12), chosen and dearly loved (John 15:16), a new creation (2 Corinthians 5:17), a joint heir with Jesus (Romans 8:14), a saint (Ephesians 1:1), righteous and holy (Ephesians 4:24), dearly loved (Colossians 3:12), completely forgiven (1 John 1:9), totally free (John 8:36), and uniquely designed (Psalm 139:14). I also learned that it was Satan who held that negative grid system in place, and it was up to me to demolish his stronghold by the power of the Holy Spirit. I came to a crossroads in my spiritual journey. I could continue believing the lies or I could begin believing the truth. Jesus said, “You will know the truth and the truth will set you free” (John 8:32). I decided to believe the truth. It was difficult and didn’t feel comfortable at first. Like the lame man who regained the movement of his legs, or the blind man who received his sight, I had to adjust to my new belief system. Oh my friend, God has so much planned for you to do and to be, but if you are operating with a false sense of who you really are, you may be paralyzed. On Jesus’ first day of public ministry, He walked down to the river and was baptized by His cousin John. As Jesus came out of the water, a voice came from heaven: “You are my Son, whom I love; with You I am well pleased” (Luke 3:22). God says the same thing to you…and to me. This devotion is very personal for me. I’ve told you some of my deepest struggles. But I want you to examine your own thought life. Do you believe lies about yourself or do you believe the truth? Here’s my challenge to you at the start of this New Year: Start believing that you are who God says you are. That truth will set you free! Dear LORD, I have believed the enemy far too long. I have seen myself as not good enough, not smart enough, and not spiritual enough. But today, I am going to start replacing those lies and replacing them with Your truth! I am a child of God who is chosen by the Father, enveloped by the Son, and empowered by the Holy Spirit. I am the one You love. If someone asked, “Who are you?” what would you say? If someone asked God, “Who is she? (meaning you), what would He say? Go back to today’s devotion and highlight the verses about your new identity in Christ. Write them on an index card. Put them with your makeup mirror in your purse. Remember who you are. The devil doesn’t want you to see yourself as God sees you. He knows who you really are, but if he can keep you from believing it, he’s won. Let’s don’t let him! 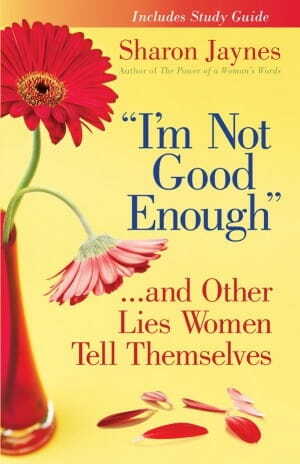 To learn how to replace the lies with truth, check out my book, I’m Not Good Enough…and Other Lies Women Tell Themselves. On my bookstore page, you’ll also find a laminated card with verses about your true identity that you can tuck in your Bible for quick reference. And…drumroll…the expanded print version of A 14-Day Romance Challenge with over 250 ways to romance your husband is now here!